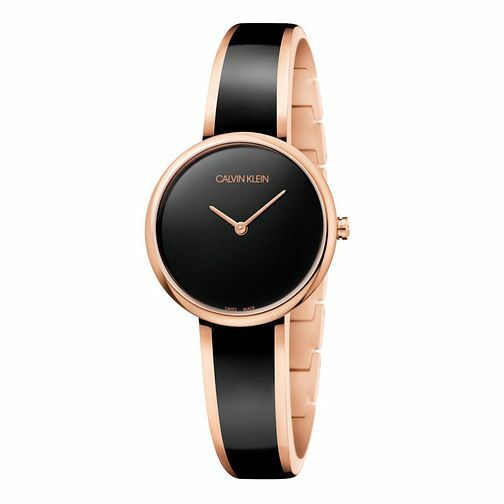 Smart, sleek and chic, this Calvin Klein Seduce ladies' watch presents a smooth rose gold rose gold tone case, with co-ordinating hands and PVD. A stainless steel semi-rigid jewellery style bracelet is the setting for this sophisticated timepiece, refined with black resin. PVD watch features semi rigid jewelry-style bracelet refined with black resin. A classy accessory, ideal for a woman on the move. This watch is water resistant up to 30 metres.